Israel’s solar energy pioneer Prof. Jacob Karni isn’t a threat to Australia’s coal-burning industry. His aim, with the financial backing of an Australian firm, is simply to make the coal-burning industry less polluting by using energy collected from the sun. Karni’s NewCO2Fuels is first testing its technology in Israel, where the team is building a solar reactor based on Karni’s 25-year career in solar energy research at Israel’s Weizmann Institute of Science. “Brown coal is a good source of energy,” Karni tells ISRAEL21c. Carbon dioxide (CO2), a byproduct of burning coal, is considered the main contributor to climate change. And when brown coal is wet, as it is in Victoria, the coal burns less efficiently and the greenhouse gas emissions increase. “Our plan is to make the coal burning less polluting in every sense, in terms of greenhouse gas, and our technology can also scrub the other pollutants from the emissions,” says Karni. According to laboratory experiments, Karni expects to reduce the CO2 emissions of a given power plant by about 50 percent. And the agent of change? The sun, of course. NewCO2Fuels applies highly focused solar rays at high temperatures to dissociate CO2 gas to convert it into a carbon monoxide and hydrogen fuel called Syngas. This fuel may be used in power plants or vehicles. While solar energy might seem like a natural choice, it is a huge challenge making its application cost-effective and competitive with fossil fuels, says Karni, who earned three degrees in science at the University of Minnesota in Minneapolis before returning to Israel in 1989 with his wife and four children. His primary research collaborators on the work leading to technology licensed by NewCO2Fuels are his former graduate students, Yury Alioshin and Gidon Ferdiman. 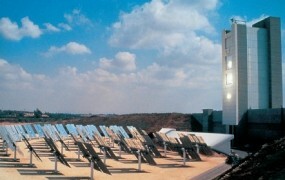 Among his other collaborators are Tareq Abu-Hamed, an Israeli scientist who was a post-doctorate fellow at the University of Minnesota, and Michael Epstein, head of the Solar Facility at Weizmann. His group is also responsible for the technology upon which two promising Israeli solar energy startups, AORA Solar and HelioFocus, are based. NewCO2Fuels is based at the Science Park in Rehovot, near where Karni works as a researcher at the Weizmann. The demonstration unit is under construction at the solar tower laboratory in the institute’s Canadian Institute for the Energies and Applied Research. Founded in 2011, the 15-person company is 50 percent owned by Greenearth Energy, a geothermal company backed by the ERDI Group of Melbourne, while the second half is owned by company employees and YEDA, the technology transfer arm of the Weizmann. As for prospective buyers and strategic partners, NewCO2Fuels is expected to go well beyond Down Under, to the solar energy markets in southeast United States, South Europe, North Africa, China, India and southern Israel. “The power plants can be anywhere where carbon dioxide is being produced, either by coal or natural gas burning, preferably in or near a sunlight-rich region,” Karni tells ISRAEL21c. Australia sees the appeal because it is a green-forward-thinking country with a vast resource of easily accessible brown coal. This new advance could give business and coal owners in the State of Victoria, where a vast majority of brown coal lies, legitimization and reason to continue using this fuel resource in a more responsible and efficient manner. To date, about $6.5 million has gone into financing the project. It will be ready for further investment in about one year, and Karni expects to see sales in about four years.